CAE Conference is the most important event in the field of engineering and science based on simulation and is so strong that it creates annual business results – which can involve both suppliers in all sectors, both the research industry and the Software vendors. This pioneering industry-led conference is concerned with traditional methods and engineering approaches. It thus creates new sources of connection for new ideas to be adopted. The event also appears to be a basis for the exchange of new developments and results, opportunities to be discovered through new technologies and techniques. They will make it possible to accelerate leading companies. 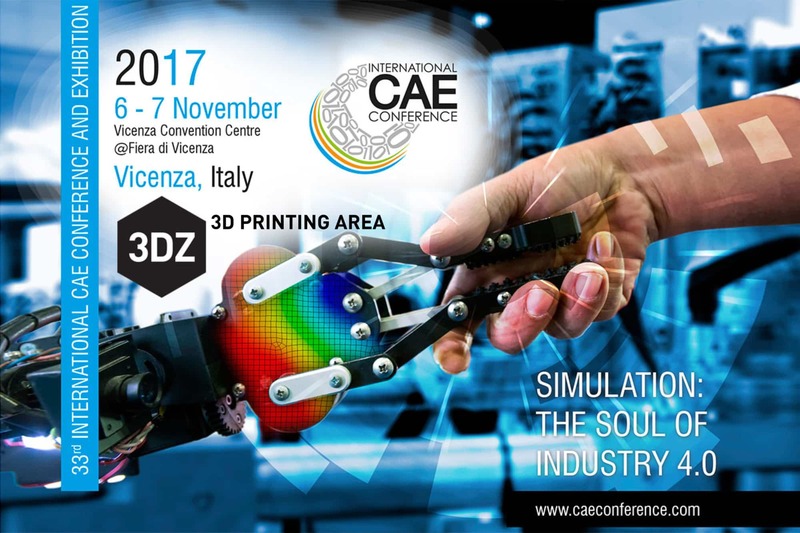 The 2017 edition of the CEA conference will be held in Vicenza on 6 and 7 November. It will be characterized by several parallel sessions on a variety of sectoral verticals. Such us: aerospace, energy, transportation, materials processing, consumer goods, civil and construction and biomechanics. Round tables and workshop will complete the 360 ​​degree conference offer. 3DZ, Europe’s leader in Additive Manufacturing’s production solutions for the 3D printing industry, presents the various possible alternatives currently available in Manufacturing Additive. You will see concrete cases, applications and best practices. Vicenza will have an area dedicated to the production of additives, where 3D printing specialists will explain different technologies, 3D printers and 3D scanners of various international brands (HP, 3DSystems, Markforged, Formlabs, Artec3D, FARO, Materialize etc.). 3DZ has a wide range of materials (plastic, metal, reinforced carbon fiber) with the ability to see more 3D printers and 3D scanners in action. During the dedicated session, 3DZ specialists will describe in detail the technologies such as SLA (Stereolithography), SLS (Sintering), FDM (Filament Depot), MJP (Multijet), CJP (ColorJet) and what are the main criteria for choosing the most appropriate for each specific case. If it is a heat exchanger, an RF filter, a robotized, a refrigerant conformation, a plastic injection, a water pump, Additive Manufacturing can offer tremendous benefits in terms of time production and optimization. Beyond the 3DZ exhibition area will hold Best Practices to deepen different themes. At the same time share new business challenges and scenarios. For more information, consult the agenda.